What is Psoriasis? 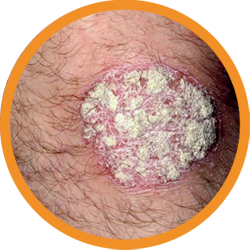 | Fondazione Natalino Corazza Psoriasi & Co.
Psoriasis is an immune-mediated chronic and recurring disease that causes raised, red, scaly patches to appear on the skin. 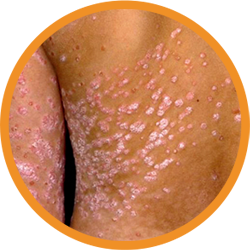 Psoriasis is associated with other serious health conditions, such as diabetes, heart disease and depression. Why does it form patches? Why has psoriasis chosen me? How is Psoriasis diagnosed? What are the diagnostic tests? What are the clinical forms of psoriasis? Plaques are caused by dysfunction of the immune system that triggers an inflammatory process, by stimulating the proliferation of skin cells (keratinocytes); in this way the natural replacement of skin is intensified and accelerated: keratinocytes are unable to mature properly and reach the surface of the epidermis(Stratum corneum) in just 7 days versus the normal 24-27. This pathological mechanism makes a lasting self maintenance. Psoriasis progress is characterised by periods, also long ones free from cutaneous manifestations alternated to (relapses) of the disease with reappearance of the typical lesions. There is a genetic predisposition to develop psoriasis: this means that the disease generally affects several members of the same family; it is fairly common for patients with psoriasis to have one or more relatives suffering from the same disease. Unsurprisingly, when both parents have psoriasis, their children’s risk of developing the disease is significantly higher. According to the estimates, almost 10% of people have one or more genetic variants involved in psoriasis, but only 2-4% actually develop the disease. This and other observations have led to assume that psoriasis originates from a complex interaction between the genes predisposing to the disease and the exposure to specific environmental factors that trigger its onset. Psoriasis doesn’t choose: it is common, affecting 2 to 4% of people worldwide. 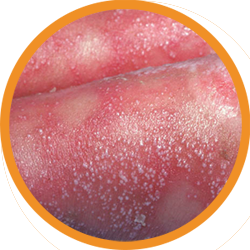 Although the disease can begin at any age, the onset of psoriasis occurs generally between age 15 and 35. About 10-15% is affected before 10 years old. Some 10-15% develop psoriasis before 10 years old. It is rare in infancy and earlychildhood. In Italy nearly 3 million people live with psoriasis. Psoriasis has to be diagnosed by a qualified specialist, namely the dermatologist. Red spots on the skin may be associated with a wide range of conditions, from mild to severe, therefore it is important that they are evaluated by an expert in skin diseases. The first step is a thorough physical examination; after that, the dermatologist may decide to perform a diagnostic skin biopsy by taking a very small sample from the skin lesion in order to examine it under the microscope and confirm the diagnosis. The dermatologist may also decide to perform a blood test, especially if you are already on medical treatment for psoriasis, to monitor general health conditions and promptly identify any associated diseases. 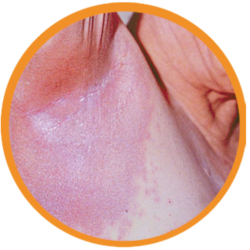 There are different clinical forms of psoriasis. the most common form; the typical lesions are red well-demarcated patches and plaques covered in coarse silver scales all over the body. characterised by the abrupt appearance of multiple small lesions of the skin called on the trunk, arms and legs; it is often triggered by an infection of the respiratory tract. features whitish pustules surrounded by erythematous (reddened) skin, producing yellow secretions and forming crusts. presents with large areas of intense red colour and exfoliation affecting the entire surface of the body. Psoriasis can appear anywhere over the body, but—on the eyelids, ears, mouth and lips, skin folds, hands and feet, and nails. The skin at each of these sites is different and requires different treatments. Light therapy or topical treatments are often used when Psoriasis is limited to a specific part of the body. However, doctors may prescribe a sistemic therapy either by mouth or injection if the Psoriasis is widespread and greatly affects your quality of life. Effective treatments are available, no matter where your Psoriasis is located. Scalp Psoriasis can be very mild, with slight, fine scaling. It can also be very severe with thick, crusted plaques covering the entire scalp. Psoriasis can extend on the forehead, the back of the head and around the ears. Facial Psoriasis most often affects the eyebrows, the skin between the nose and upper lip, the upper forehead and the hairline. Psoriasis on the face should be treated carefully because the skin here is sensitive. The psoriasis that occurs on the hands and feet must be treated promptly and carefully. In some cases, cracking, blisters and swelling. Nail changes occur in up to 50 percent of people with Psoriasis and at least 80 percent of people with psoriatic arthritis. Inverse Poriasis affects the folds of the body such as the armpits and under the breasts. This form of Psoriasis is frequently irritated by rubbing and sweating.